* The following post has been composed especially for Patti, at A Perfect Lily, who needed to see this to believe it. Readers who have been with us for some time are very familiar with Josie's beloved companion who is so important in her life, that he probably deserves a spot on the "About Us" page. 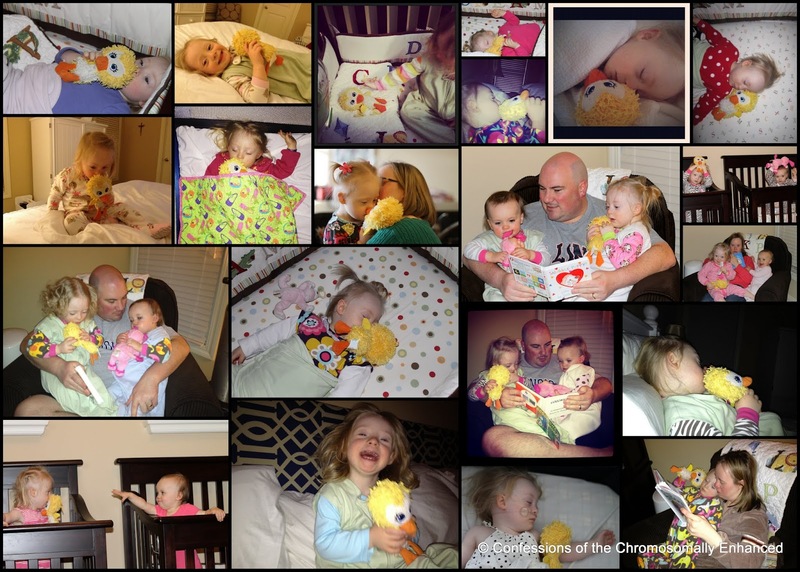 "The Chicken in the Closet" has been Josie's treasured sidekick for more than a year now. No, he's not a gay chicken who hasn't yet come to terms with his orientation. He's a hard-earned carnival prize that Aunt Leanne won for her beloved niece at the fair over the summer, and then hid in her closet until Christmas. This gift was far too special to be bestowed haphazardly. Aunt Leanne strategically concealed this fuzzy yellow fellow within the safe shelter of her bedroom closet and hyped his reveal for months. He finally found his way into Josie's arms on an occasion no less important than the celebration of Christ's birth, and he has been cherished accordingly ever since. Josie and the chicken immediately became inseparable. When Josie is with the chicken, she can't focus on anything else; she doesn't explore her environment, she doesn't play and learn; she simply sits and nuzzles her precious poultry. In fact, her fondness for the little yellow fellow quickly grew so excessive that it had to be reigned in. Josie is now only allowed access to the chicken during bedtime. During the day, the chicken must remain in the crib. Of course there are little exceptions to this rule. 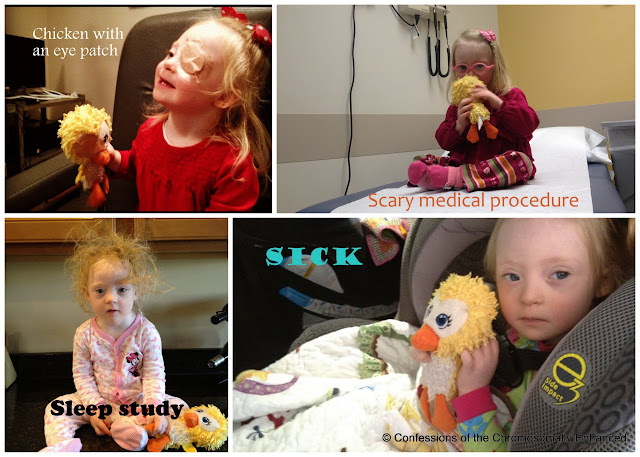 The chicken is allowed to accompany Josie to medical appointments and other scenarios in which she may need additional comfort and support. But generally speaking, the chicken must stay in the crib. It's for Josie's own good. Besides, it gives her a reason to look forward to bedtime. It's just the getting out of bed that we struggle with. The best photo ever of JoJo.... the sleep study. How did you fix her hair after that? About to watch the vid now. Now that I've watched it... the patience of a saint you have. She's dedicated. You have much more patience than I have ever had with my children. I cannot even imagine going through this ritual every day. That sleep study picture kills me every time I see it. So funny! I love the long kisses! The sleep study hair still cracks me up! Did they actually electrocute her for the sleep study??? LOL That needs to be on a greeting card, seriously. Lol She sure does love her chicken! My goodness, she kills me. Everleigh doesn't have an attachment to any stuffed animal (no matter how hard I try LOL), but after watching this, maybe that's a good thing! You definitely have nerves of steel lol. Our chicken may mysteriously go missing if I had to do that every morning lol. I still chuckle when I see the sleep study hair picture!! !